Hey there! The polar vortex has officially hit Oklahoma. We were near 80 degrees yesterday and have a high of 40 today. Yikes. I've been anticipating the colder weather and working like crazy in between some big events to finish up lots of projects that needed to be done outside. 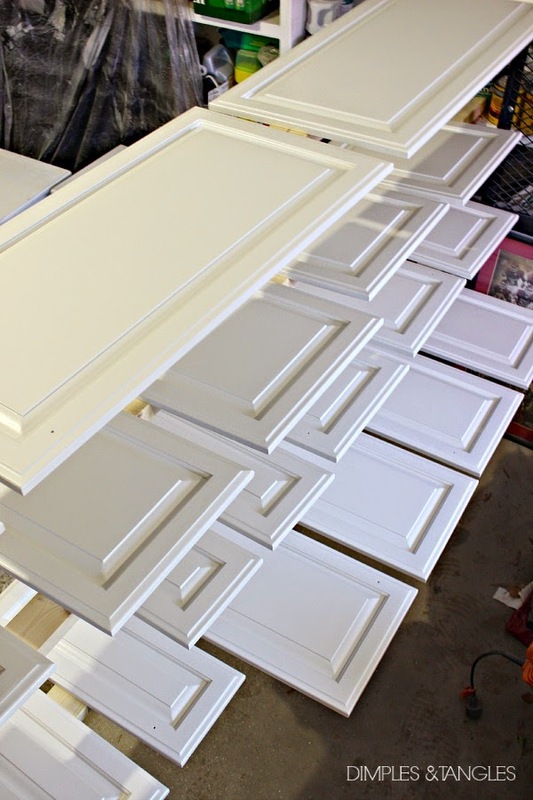 Over the weekend, I finished spraying all of the kitchen cabinet doors and drawers, 2 nightstands, 4 lamps, and a headboard. And created a fantastic mess in the garage (much too windy to spray paint outside, even though the weather was nice). Although I've finished that portion of the kitchen painting, I'm just now staring on all of the base framework. First I have to tackle this little section near the sink. When we did our big kitchen remodel 4 years ago and swung out that section of the counter in order to make room for a larger island, a weird spot was left that I didn't anticipate and didn't know what to do with. So, I just added some molding to try and camouflage it until I could figure out what to do. Here's what I came up with: On the right, I'm cutting an opening and adding a tall door. It will give more access to the area under the sink (I can slide large platters or my electric griddle through there). On the left, I'm adding a wider drawer front and new wider door below to balance things out. I'm not cutting out any of the frame there because there's a divider behind it, so the new drawer front and door will just cover some of that frame up. Not a perfect solution, but I think the new doors will look great and are the best option for what I have to work with. I'll show you a close up of how it turns out when I'm finished. As I mentioned on Instagram, I'm definitely not an open shelf person! The doors have all been off for about 2 weeks now and it's driving me crazy. I will say that it's nice and easy to get things out and put them away, but I'll still be doing a happy dance when those doors go back on. You can really see the difference between the old and new paint color here. but for the doors I have some decisions to make. 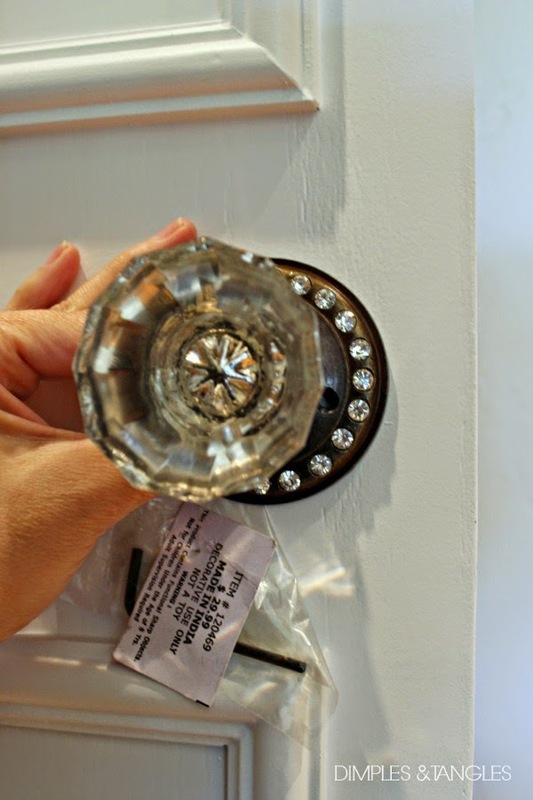 Have you seen these gorgeous new knobs from Hobby Lobby? I was there on Saturday trying to round up knobs, and saw these for the first time. Brass and glass, $2.50 each on sale!!! I'm trying to decide if they're substantial enough. Here are my top two choices. The knob on the left is from HL also, but I've sprayed the ORB backplate to match the brass. I love the fresh, modern look of the one on the right, just trying to decide if the size is right. I welcome your input in the comments! For the pantry doors I have a few hardware options also. Here's one- I would brighten the gold, but this is a standard doorknob and I just need dummy knobs, so it would take some re-working somehow to be able to attach it. Option two is an oversized cabinet knob with a backplate (to be sprayed brass). But, do you see the drawback here? The post isn't long enough to go all the way through the door. I think we could drill a larger pocket hole about 1/2" through the back to be able to attach the nut, so that might work. These also don't project as far out as the other knob, which would be good to have more clearance around the doors. Did you notice I decided to go white with the pantry doors? The votes were pretty mixed when I asked for opinions a few weeks ago. I really thought I would paint them black, but the more I thought about a black island, the stainless fridge, and black doors right there together, it just wasn't feeling right. We'll try this out for now and can always change them up later. I'm also stripping the paint off of all the brass cabinet (40) and door (16) hinges. Not hard, but slightly tedious. 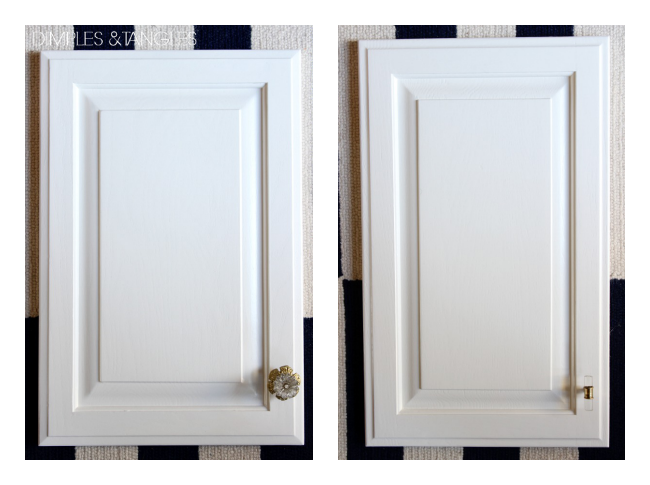 I've finished the hinges for the pantry doors and they're looking good! And I have one or two more surprises under wraps right now (I'm waiting to see if the plans in my head will work!) that you'll just have to stay tuned for. I can't wait for my own kitchen reveal, mainly because that means my work will be done! I'll leave you with a reminder of my pretty inspiration photo... Happy Tuesday everybody! 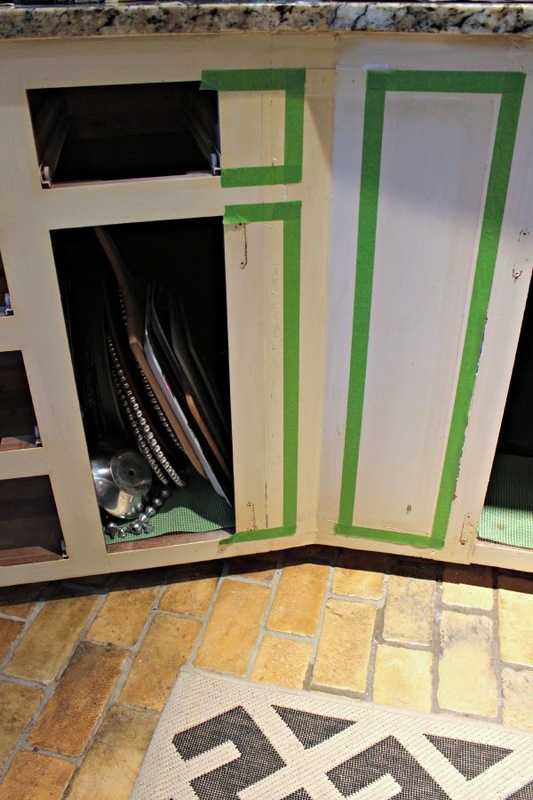 Have you tried the crock pot method of removing paint from hardware? You soak the hardware in a slow cooker with a few tablespoons of dish detergent on medium heat overnight. I am doing this room by room in my 100 year old house. Many, Many layers of old paint just slip right off! Any thing left in the crevices can be gently removed with an old tooth brush. I wax or polish mine before re-installing. You could pick up an old Crock pot to dedicate just to this job since you may not want to use the one you cook in. I found one at a thrift store, and it seems like there are always one or two in every one, don't you think? Anyway, love the white, updated paint! Oh my goodness Sasha, that's genius! Never heard of that method. I'm trying it today! You mean liquid dish soap, like Palmolive, right? I like the second knob for the pantry door for sure if you can make it work - the back plate is gorgeous. As for the cabinets - I like the modern one - simple and clean. I'm impressed you got all that painting done!! 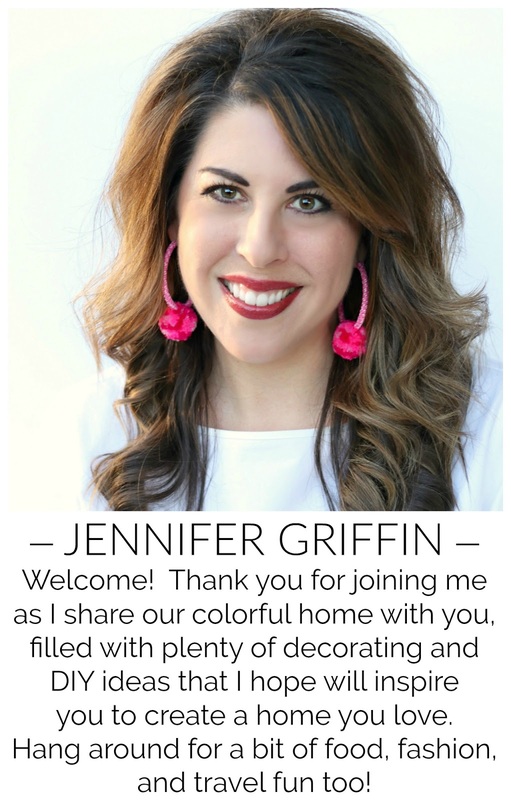 Great Job Jennifer - it's going to be beautiful! Love the pretty white and can't wait to see the final reveal. 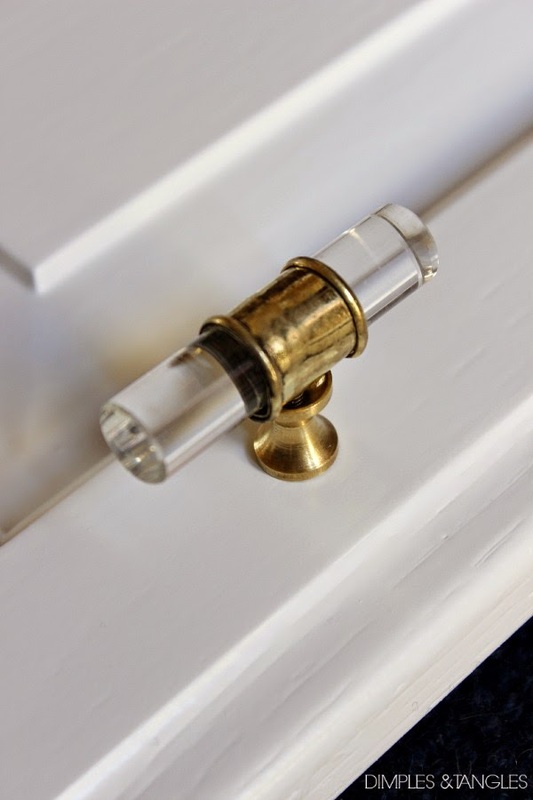 I love, love, love the brass and lucite knob, how gorgeous is that. Also, those brass pulls look amazing on the drawers too. Yes, just regular dish soap! This Old House has an article on their site if you want more instruction, but there really isn't anything else to it. Just let it soak until the paint starts to slip off. If your hardware is brass or thickly brass plated there is no danger of rust. Hope this frees you up to do something a little more fun! For sure! I'm starting it right now! Thanks. Those are both the choices I'm leaning towards. Thanks Denise! Aren't they pretty, Marty? I could not believe it when I saw them at Hobby Lobby. They're slowly but surely upping their game! Can you believe it? Emily (Eleven Gables) and I agree they need to make drawer pulls to coordinate with that style! I've only bought 4, need to track down more myself! 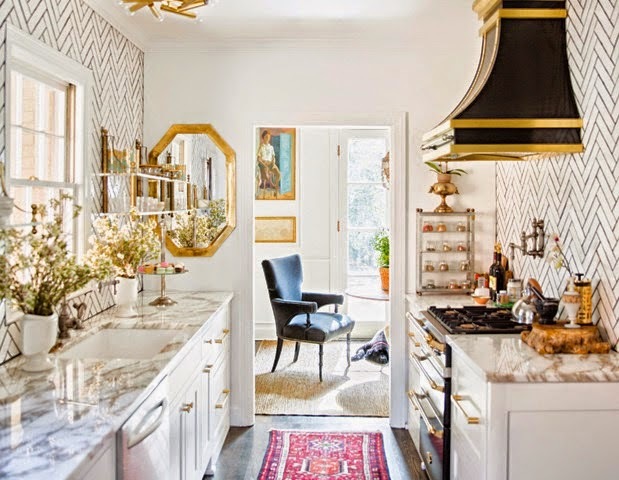 I love what you are doing to your kitchen and I can see why the inspiration photo inspires you. Cant wait to see it done! It's going to look amazing when your done Jennifer! I LOVE your knob choices!! This is going to look incredible, Jennifer! I am SO EXCITED to see it, and for you to be finished! 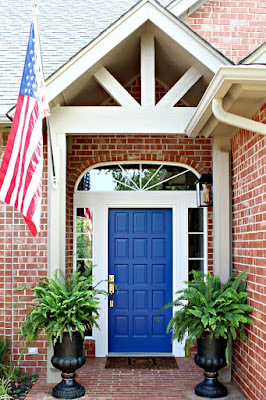 :) I really love, love, love the brass and glass hardware. It's classic and expensive looking, and it almost blends in with the cabinets, which I love. Understated elegance! What a great find! Jennifer, you are such a workhorse! Your kitchen is going to be perfect. Are you going to change to a brass faucet? I've seen some beautiful ones. I like the knobs on the right. The knobs on the left look too large. Very, very pretty. I'll have to check out HL and see if I can snag a few for future projects. LOVING the knobs on the right! And that rug - what a find! The new cabinet paint color is going to make such an amazing difference and I LOVE the rug that you found on CL - what a find!! Those HL knobs are fabulous!! Oh, those new knobs from Hobby Lobby are killer. Great job on your cabinets! Been there and done that this summer. I know it's a job. My cabinets were a similar yellow beige color and I can tell you white is so much fresher to live with. I know you are going to love it! Thanks to your instagram I stopped by my local HL and picked a couple up for my bathroom vanity I'm refinishing - they'll be perfect... thanks for the tip! So obviously.... I vote for the brass/glass option :-) Can't wait to see the finished room! Oh my sweet friend, I know this is such a project, but wow it's going to be so worth it!! 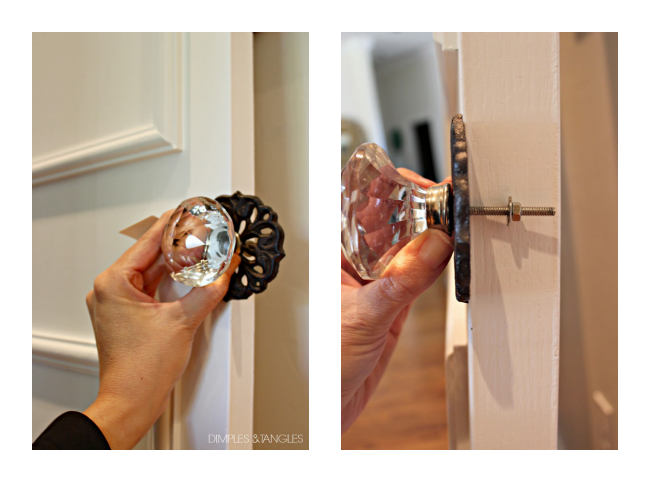 Love that fabulous lucite hardware, I haven't seen it at ours, but will be on the hunt to use it on something! Awesome score on the rug, too! This honestly pains me to watch this because I've been through it so many times. A true labor of love. Your choices are amazing and I know it will be gorgeous! 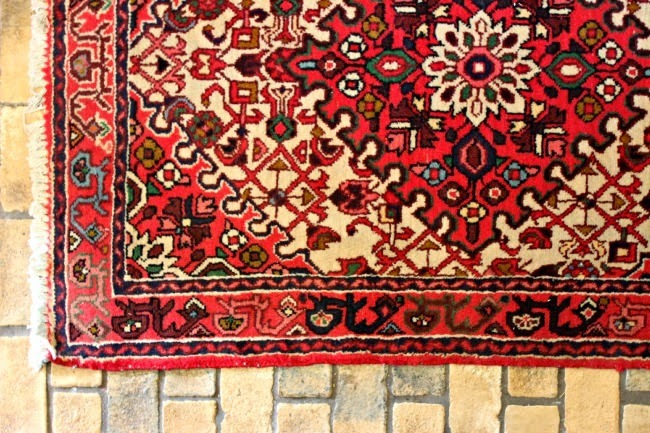 Bravo and the fabulous rug find! wow, you are making some serious progress! I need to get my hands on one of those paint sprayers! I love those knobs from Hobby Lobby, I saw someone post them on instagram the other day and couldn't believe they were from Hobby Lobby. I know what you mean about them maybe not being substantial enough, but I think once they are on all the cabinets they will be really cool! Still loving your rug and can't wait to see your surprises! I am dying over those knobs you found! I've gotta find a way to work them into my house - love them! Wow it is coming together so well! I love the hardware from HL, esp the glass and brass knob on the right. And that rug!! This is looking SO great Jennifer! I'm dying to give my kitchen a mini makeover. 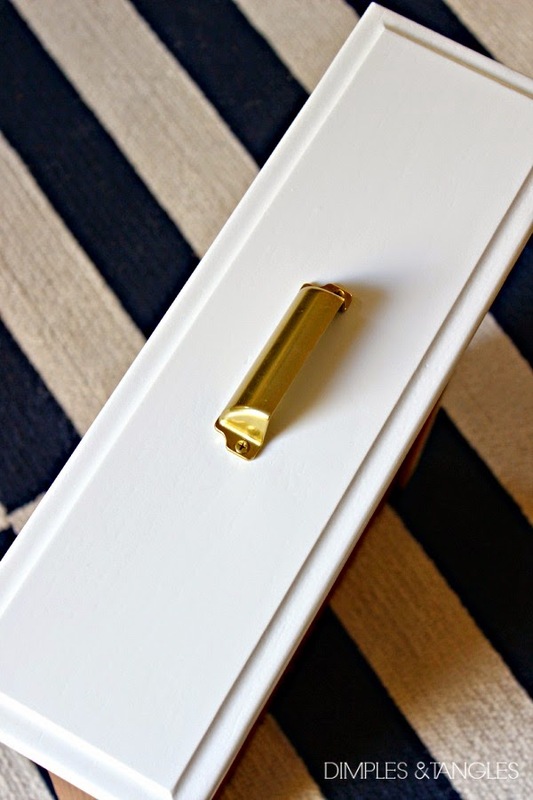 I love the brass and lucite knobs! They look a bit small in the photo but I'm wondering if they look more substantial in person? Jennifer I'm loving the white with the gold hardware!! So pretty!! I like that last knob you had in mind for the pantry, that plate detail is so pretty! Tough call on the knobs, the lucite looking ones are just gorgeous - I love them - but from afar they kind of look smallish. Hmmmm. I think you have a fabulous eye so I'm sure you'll pull it all together beautifully!! 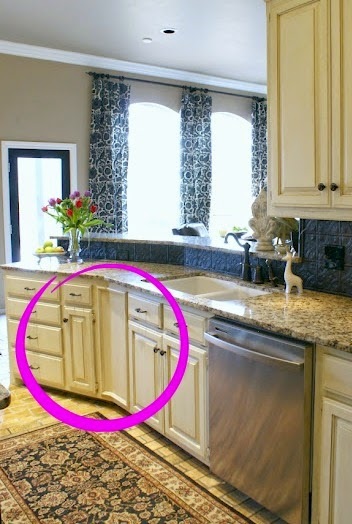 What is the white color of paint you used for the cabinets? Yay for progress. Its going to look so so good Jennifer. It already is. Love those knobs. Cant even believe they were so inexpensive. I dying to see them all together. Loving that rug too friend.